The next generation of the high-speed Thunderbolt specification was announced on Tuesday, ditching the legacy Mini DisplayPort connector for the new smaller, reversible USB-C standard, and offering transfer speeds of up to 40Gbps with high-end cables. 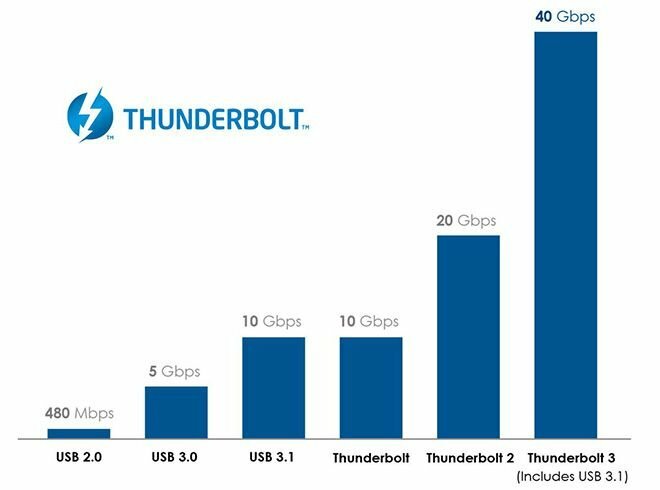 Thunderbolt 3 will be a "superset" for USB 3.1, which runs at 10Gbps. Using a standard USB-C cable, Thunderbolt 3 will offer transfer speeds of twice that, at 20Gbps. Users who buy an active copper USB-C cable will gain access to 40Gbps transfer speeds with Thunderbolt 3. And optical cables supporting the new standard will offer that same speed over greater distances when they hit the market next year. Because Thunderbolt 3 is compliant with the USB-C standard and USB 3.1 specification, the cabling will also simultaneously support DisplayPort 1.2, third-generation PCI Express, and power supply for recharging notebooks at up to 100 watts. With a single active copper cable, Thunderbolt 3 will enable dual 4K monitor support simultaneously with 10-gigabit Ethernet networking. Computers supporting the Thunderbolt 3 specification are expected to hit the market later this year. It's likely that it will require Intel's next-generation Skylake processors. Apple was among the first to adopt the new USB-C connector with its all-new 12-inch MacBook, featuring a single USB-C port for both charging and connecting devices. USB-C is reversible, like Apple's proprietary Lightning connector, but the open standard is expected to be adopted by most forthcoming PCs and will not be limited to Apple hardware. 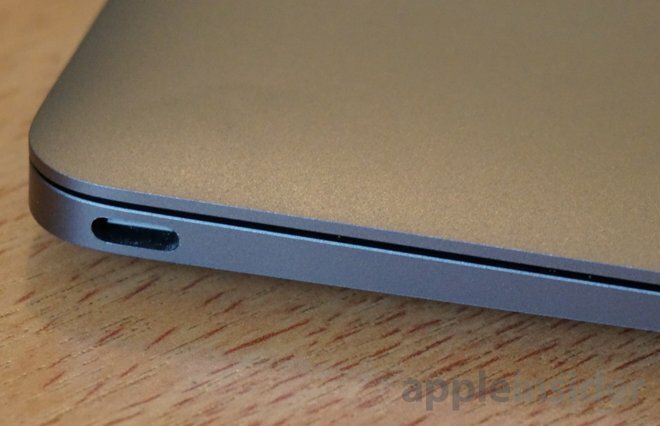 The USB-C connector on Apple's current MacBook. Future hardware will support Thunderbolt 3 in addition to USB 3.1. With support for Thunderbolt 3, it's likely that USB-C ports will find their way onto Apple's MacBook Pro lineup with an accompanying Skylake upgrade. Apple recently upgraded its 13- and 15-inch MacBook Pro models with Force Touch trackpads, but those machines continue to feature legacy full-size USB connectors, and do not feature any smaller USB-C plugs. Because the unified Thunderbolt 3 port standard won't arrive until later this year with new hardware, Apple's current sole USB-C machine, the 12-inch MacBook, will not support the new specification.